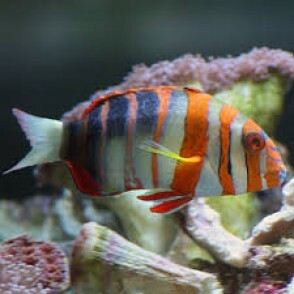 The Harlequin Tusk originates from the reefs of the Indian Ocean and Australia. 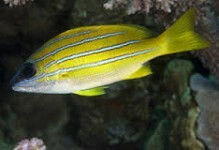 Indian Ocean Tusks have orange stripes with white margins and a hint of blue adjacent to the tail of the fish. Australian Tusks have orange stripes with vivid blue margins starting from the pectoral fin, along the fishes back to their tail. Both of these beautiful color forms have bright blue teeth or tusks used to crunch invertebrates. 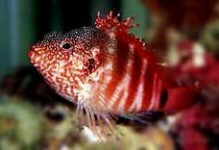 They are a wonderful fish for a FOWLR (Fish Only With Live Rock) aquarium. 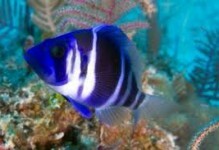 These fish are typically shy when at a small size, but will in time gain personality and confidence as they mature. A 125 gallon or larger aquarium with plenty of live rock for hiding places and moderately aggressive, active fish such as Angels, Tangs, and smaller Triggers is an acceptable environment. Keep only one specimen per tank. 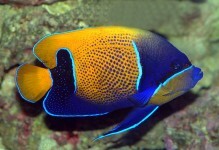 Although they will not bother corals, they will eat any small crustacean such as snails or crabs. The Harlequin Tusk Wrasse diet should include vitamin enriched frozen mysis shrimp, vitamin enriched frozen brine shrimp, and other meaty foods along with a high quality marine flake and marine pellet food.